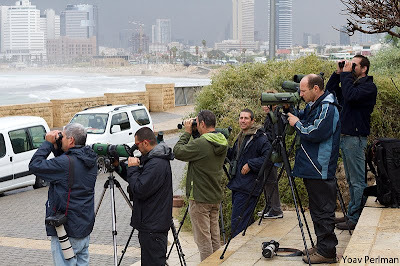 Spent a few hours seawatching at Jaffa this morning. It was pretty rainy but between showers it was actually not a bad morning. Funny enough most birds of interest were not seabirds. Highlights were four Short-eared Owls (I saw two), 1 Euro Nightjar that flew in off the sea, 5 Med Gulls, 2 skua sp., 1 Yelkouan Shearwater (before I arrived), 16 Greater Flamingos, and four thrushes that were probably Fieldfares. Large gulls included several fuscus, michahellis, cachinnans and heuglini. It was good to catch up with ALL the guys. At most times there were more birders than birds to be seen.